Yorick is based on a monospace typewriter font (model 3402U) found in the Campionario caratteri e fregi tipografici (specimen book) of the Nebiolo typefoundry, dated 1920 – but the font might probably be older. Matthieu Cortat began his design in 2016, Yorick keeps the essence of the original design, and avoid making it look too digital or constructed. he describes it as a gentle industrial font: a font of engineers in Oxford shirt and Tweed suits! Recently released by 205TF, Yorick’s italic is a proper one, not a slanted roman. It comes 4 styles, each with a large character and an ingenious approach to spacing alternates; while Yorick is a monospaced font it also contains alternative glyphs set to half and one-and-a-half width. I asked the Matthieu to tell us more about his process and the fonts features. What drew you to the model 3402U monospace typewriter example? 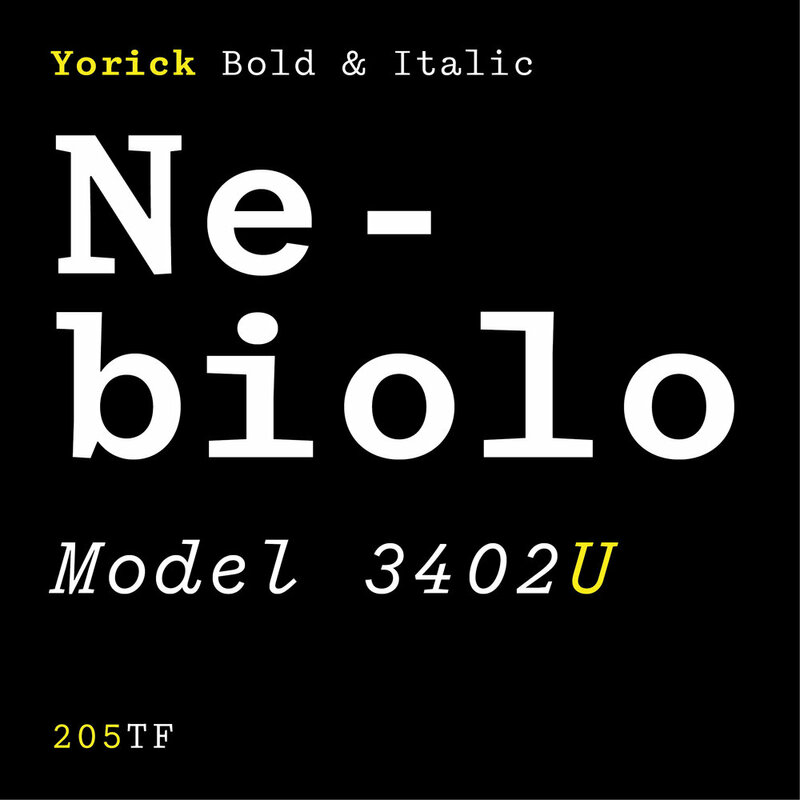 And do you see Yorrick as being a revival or more loosely having drawn inspiration from the 1920 Nebilo specimen? I found the source displayed among many other monospace typewriter fonts. In comparison with the others, it had this “relax” style I found very attractive, especially next to those other fonts, which were either mimicking “typographic fonts”, either pushing the mechanical aspect of an “engineer typeface”. Then, as usually when I do “revivals”, I looked at it in depth, analysed it,… and left it in my drawer for months. Then I started to design Yorick. With an imprint of the original, but looking at it very loosely, always trying to find my personal way of working on those letterforms. Yorrick's design development was a 2-year process. Were there any surprises or challenging parts to the development methodology? Of course there was. Especially when I started develop the bold cuts. Regular was partially based on the model. For the Italic, I really wanted to make it playful and fresh. So I had more room for interpretation. But then, Bold cuts were the real challenge. I had hard times finding the right balance of thick and thin strokes. Constrained by the width, I failed several times to find the good boldness, particularly for the serifs and connecting elements. Using the same thickening as for thick strokes was leading to plumpy forms, as if there was too much ink on the typewriter’s ribbon. At the opposite, keeping a strong contrast was leading to a blinkering effect, not suitable for running text. I needed a lot of proofs – and a long time – to figure out a good compromise. I was happy to see the selected solutions working efficiently on Cyrillic script when I started developing it, particularly with the super large and complex glyphs it contains. What did working on this font family teach you that you might apply to future designs? Maybe to take care about the relation between weights within a family, even if there are only two weights. Selecting what I felt the right ones and only providing those weights is the best answer for customers. That’s part of the designer’s job to make choices. Leaving the user with thousands of possibilities might be interesting for some projects (as for variable fonts) but leaves also the responsibility to others. In the case of Yorick, these choices were really motivated by numerous tests. That’s part of the added value of the font. The source itself was already quite gentle, as it was printed in relatively small size. At the same time I was working on it, I had the occasion to read a research text by Davide Tomatis, one of my students at ECAL. He was looking into the history of the Nebiolo type foundry, particularly the relations of their drawing office with strong personalities as Alessandro Butti and Aldo Novarese. The texts and the illustrations showed a work process more humane and gentle than one could have thought when speaking about industrial production. I thought this “gentle touch” was lacking in the typewriters fonts currently available, many of them stressing the industrial aspect of this kind of letterforms. Yorick is an alternate answer to that kind of genre. What is your favourite feature or detail in Yorrick? The “semi-mono” option, of course. I also like its lower case “a”, without any straight element! I don’t really have any idols. I have a certain appetite for the British (Edward Johnston, Eric Gill and, slightly closer to home, Paul Barnes) and the French (Ladislas Mandel, José Mendoza, Louis Jou) for questions of style. When it comes to questions of finishing and a certain rigour in development however, I am firmly on the side of the Swiss (Adrian Frutiger, Max Miedinger, the Optimo and Lineto foundries, for example). The American and Dutch typographers are somewhat a mystery to me. I would place myself nearer to typeface designers that are “sculptors” as opposed to “calligraphers”. You have taken a clever approach to monospacing with alternates for half and one-and-a-half width glyphs. Where did you get the idea for this flexibility with spacing and how do you hope to see it utilised by designers? It came up during discussions at 205tf offices. They frequently use monospace fonts, and such a simple feature was something they always wanted to try out. Yorick – already flexible and gentle – seemed a good candidate for such a treatment. The problems of dark and light spots of monospaced font could finally quite easily be solved by half and one-and-half width. After a few tests, we decided to implement it in the whole font, including for Cyrillic, for which it was a real breathe of fresh air. We also decided to keep it simple of use; otherwise designers would use it badly, or even worse: not use it at all. Now I’m really looking forward to seeing what people will do with the font. I hope they’ll surprise me! Try and buy Yorick exclusively here Matthieu chooses to distribute his faces via the French 205TF foundry because “Beyond the shared infrastructure that allows a greater functionality that would be complicated to put in place for an isolated designer, there is the choice of the catalogue: few typefaces, but well chosen, with high standards, designs, spacings and kernings all being verified by a number of people. While the “great foundries” have catalogues that seem to go on forever, and look like supermarkets, 205TF is a gourmet food store: a more refined choice, and filled with quality. Newer:On May 25, 2019, Fontstand brings its second international typography conference to Porto, Older:Today Sarah Hyndman's latest project is What's Your Type? : The Type Dating Game Launches!